Water reed has been used on thatched roofs for centuries. A well thatched roof in water reed should last in excess of twenty five years and with regular maintenance up to forty five years. With little aesthetic difference to that of wheat reed it is often hard to tell the two materials apart. 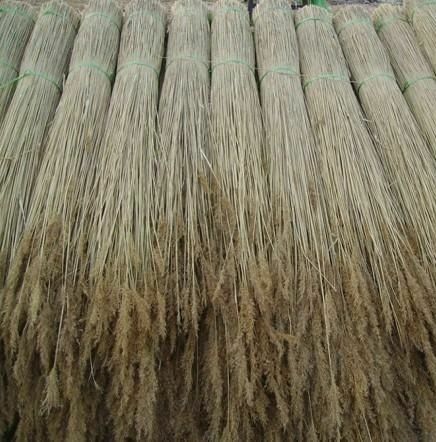 Water reed is a natural growing crop found in all areas of the world. The main supply of water reed from Britain is located in water reed beds in Norfolk and has been used on thatched roofs throughout the UK for many years. However, with conservationists having had a huge impact on this industry, (which otherwise managed to survive unaided for many centuries), vast areas of wetlands have been reclaimed and, as a result, only twelve reed cutters now operate in Norfolk. Like wheat reed, intensive farming of water reed, which involves the use of artificial fertilizers, (that creates nitrates), has had a detrimental effect on reed: affecting the hardness of the reed and weakening the stems. Our company imports reed from Europe where there is a readily available supply of quality material.